Have you heard the amazing story about the world renowned Rabbi Yitzhak Kaduri who left a sealed message to be opened a year after his death? He said the Messiah had appeared to him and that the message would contain the Messiah's identity. And, when the message was opened in 2007, it shocked the entire Orthodox Jewish world, so much so in fact that they have tried to keep it quiet ever since. 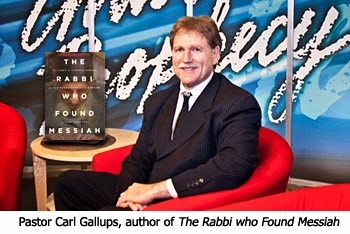 Pastor Carl Gallups of Carl Gallups Ministries, author of one of the best apologetics books called The Magic Man in the Sky , reveals just what the rabbi's message said and how it has shocked the Orthodox Jewish world in his latest book The Rabbi who Found Messiah. The Kaduri story has also ignited a firestorm of controversy in the Christian community, so much so in fact that we have invited Carl back a second time on Christ in Prophecy to discuss the impact this story has made. Carl Gallups: Another complaint that I get is, "Why would Kaduri leave a note? Why didn't he just immediately start telling people about Jesus?" Nathan Jones: Yes, if Kaduri was really saved, he would have been running into the streets proclaiming, "Jesus is Lord!" Dr. Reagan: They've never heard of Nicodemus, have they? Carl Gallups: That's right, nor never heard of the Apostle Paul. It took Paul 17 years before he went out into the mission field. We read Galatians 1-2 where Paul states that it was three years before he went to Jerusalem to talk to the Apostles. He said after that it was 14 years later before he went back to the Church. Paul also said he needed to start preaching to the Gentiles. Why? Well, first of all, he was persecuted unmercifully by his own people. So, just think, Kaduri was really old. He was 108. If you had asked me why he left that note, when I first started writing the book I would have scratched my head and said, "I don't really know." But, after I wrote it, this is what the Holy Spirit has given me to know now. I know if God had really revealed Himself, then how brilliant a plan was this? Kaduri died just a few weeks after making his note revelation. I don't think Kaduri could have known that he would die so soon, but he said essentially, "I'm putting this in a note to be opened one year after my death." So, he created an interest, a fascination, in his message. One year later after Kaduri died, everyone was so eager to see what his note said. It was put on his website. Why? Because the note didn't say, "Jesus Christ is Lord." If the note had said that, when they opened it, they would have burned it, spit on it, and threw it away. Nobody would have ever known Kaduri's message. Instead, Kaduri's note was encrypted in a Hebrew phrase that described Messianic traits. The rabbis soon discovered he had left a decoding formula. Take the first letter of each of the six Hebrew words in the note, and it'll reveal where you'll find the name of Messiah. It actually took the rabbis a few weeks to decode it all. In the meantime, screen captures were taken of the note and the media was reporting on it. 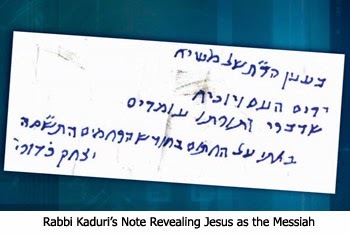 The rabbis were so thrilled that Rabbi Kaduri had left this note, that is until after they decoded it and saw that it said Yeshua is Messiah. Oh, the rabbis freaked out. They shut the story down. The rabbis knew this wasn't some false Jesus. Kaduri's note was talking about Jesus the Messiah of the New Testament! I just think how brilliant it was for Kaduri to put his note out there in the public, because now it cannot be covered up. The book I've written and the movie that was made, they cannot be covered up. Jews are coming to Jesus in the streets like never before since the time of Jesus Himself. I believe leaving the note was a prophetic and brilliant plan on God's part, and that's just how God would do something. Order your copy of this special offer today! The note (acronym )that the rabbi left puts me in mind of the blindness of the jewish people of the day and also the fact that they will not receive him until a time has passed. It was very 'clever'. And the actual way it was all hidden away after they saw the name is telling also. The whole thing is a picture of how the Jews have behaved and believed during that/ this time. It is like a hidden message inside a hidden message. 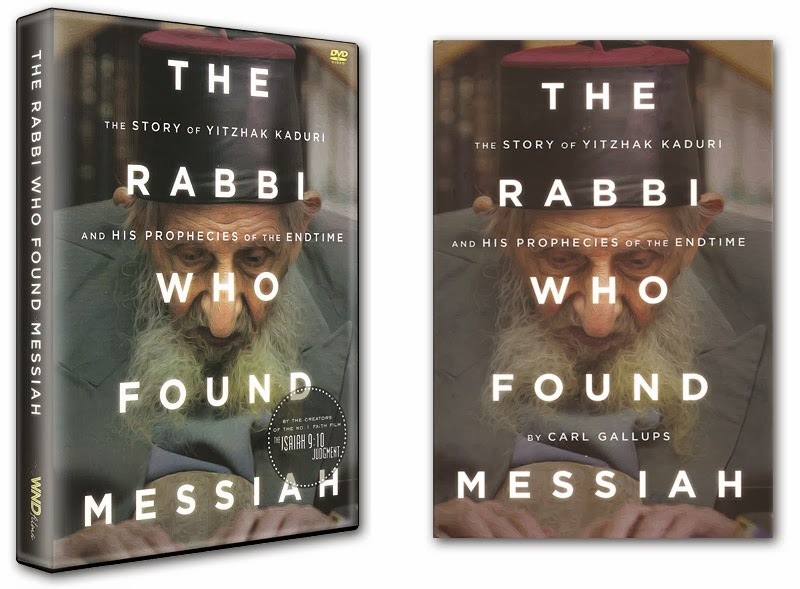 Still waiting for Carl Gallups to address the fact that the description of the Messiah according to the Rabbi doesn't resemble Our Lord Jesus. Again, saying the name of the Messiah is Jesus is NOT the same as saying Jesus is THE Messiah. Again, saying the name of the Messiah is Jesus is NOT the same as saying THE Jesus known to Christians from the New Testament is the Messiah. The Rabbi described a completely different portrayl of the Jesus Christ Christians know. Billy, check out the Present Messiah Criticism. Thanks for pointing that out, Nathan. I missed that part or read it and it didn’t register. I was typing an opinionated rebuttal (can you image ME doing that?) and decided before I posted it perhaps I should search the net for more info about the “two Messiahs”. I found a great article at the Jews for Jesus website. It explained the whole concept to me and, just like a cartoon, a light bulb appeared over my head. My eyes opened up and I understand now the point Pastor Gallups was making. Now that I have an understand of the “two Messiahs” viewpoint of the Jews I have to admit I can now see the story Pastor Gallups is trying to tell about the note from the Rabbi. p.s. Thanks to this website (aka Nathan) I can work out things in my mind and think them through so that I better understand things. So thanks for the opportunity to learn. All that being said (in my comment above) I still don't believe the Rabbi got it right. I understand Pastor Gallup's take on it but I still clearly see the Rabbi did not get it completely. I still think the Rabbi thinks Jesus has not come yet and there are still 2 Messiahs to come. So in my opinion Pastor Gallup is adding his own "spin" to the story. To imply the Rabbi, though naming Jesus, actually was talking about THE Jesus, is still in question. Glad to hear about you "lightbulb moment", Billy! I appreciate your zeal for the truth. Rabbi Kaduri was a false prophet! Nice people are used by the enemy as angels of light. People can only be saved by G-ds Grace through faith in G-d/man Jesus of Nazareth. Wasted my cash to test the spirit behind the rabbi, just to make certain I hadn’t misjudged the false Jesus. Just one false prophecy marks a fake, and he made many, like Jesus will return physically not as a vision or dream. Messiah did not return after Sharons death. Kaduri was nothing like Saul of Tarsus who studied G-d’s Scriptures zealously, that’s why he had Christians killed, he genuinely thought they were undermining Scripture and that was enough for the death warrant to be served on them Acts 26:4-11 Saul was genuine and would have been horrified at Kaduris practice of spiritism which is witchcraft. Saul would know ‘you shall not suffer a witch to live’ and would have expected to be stoned had he practising Kabbal. Saul heard a voice in Acts 26 but then studied under Yeshua face to face for three years in the desert in Galatians 1 just like Moses before him.That’s how he could truthfully claim to be no different to the other apostles who were also sinners who sought to obey G-ds will. Read Acts 26 about Sauls conversion to see there is no comparison between Saul and Kaduri who was deceived by a lying spirit, and if people have been saved its because genuine Scripture was pointed out to them by real Christians. What then? notwithstanding, every way, whether in pretence, or in truth, Christ is preached; and I therein do rejoice, yea, and will rejoice.Phil.1:18 This is what the converted Saul when in spite of falsehood people still got to be saved thru faith in Messiah. Unless Kaduri met Yeshua the Messiah thru G-ds Scriptures and faithed in the G-d/man Jesus of Nazareth he died in his sins. Why would G-d leave souls to be lost for a whole year before ‘jesus’ was revealed. Now is the accepted time, now is the day of Salvation (Yehoshua). Every other kid was named Yeshua, it was a very common name as Joshua was a mighty warrior of Israel and was obedient to G-d. I wrote this to brave Billy who must not keep his mouth shut when he suspects error. Billy was right to question Lamb and Lion who have to be prepared to give an account of this sensationalising just to ‘report’ what an author is claiming. Wild speculations and tickling ears are not recommended by Saul/Paul and it is irresponsible to feed readers with doctrines of demons. Of course G-d speaks to sinners, that is exactly what His Gospel is for; but then they must do works of repentance and put their faith in Messiah Yeshua to save. G-d also spoke to a donkey and when it was all over, it was still a donkey.